Some reasons are obvious: many women do not have family members or compatible friends who wish to travel. When going on a main-stream tour, women often find that most activities are geared towards couples, and quite often they feel left out. Singles' tours are not always what women are looking for. If you do not have a traveling companion, there is also the issue of the expensive "single supplement", sometimes as much as 50 or even 100 percent of the tour cost. By going on women-only tours, women can easily avoid paying for the single supplement by sharing a room with another woman traveler. Other reasons are less obvious: The company of other women is good for our souls. We can let our hair down and be ourselves. We can do as we please and take on a daring adventure without being patronized. We can immerse ourselves in deep consideration of a work of art or the region's history without being interrupted. We can be silly without being embarrassed or having to explain our behavior to anyone. Travel gives us an outlet to be just a little bit crazy for just a little bit of time. What makes women-only travel different? In their content, women-only tours are not very different from other quality tours. We also visit Westminster Abbey in London and watch the astronomical clock strike the hour in Prague, but the real difference is in the relaxed pace and in the selection of additional activities on tours. Since we are very interested in connecting with the people and not only in the sights, there are various cultural immersion programs and activities that allow for an in-depth, cultural and historical appreciation. 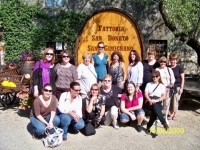 The mood of women-only tours is very light and unrushed. The activities start later to allow for unhurried breakfast, meals take longer to accommodate meaningful conversations. 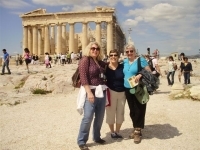 Sights and Soul Travels' tours also focus on other women-centered activities: spa, massage, soft adventure, cooking lessons and folk dance classes. There are other activities related to gardening, antiques shopping, piano concerts as well as art museum explorations. The relaxed pace of the tours, along with a small number of participants makes them feel like a group of friends traveling together. It encourages connections between the traveling companions and there are always new friendships made. Talking, laughing, getting to know each other and making friends from different cities and different countries is as much part of the experiences as visiting the tourist attractions on the itinerary. What do you think is important for women while traveling? Feeling that you are special and that your interests are special and being treated as a personal guest. We find that most women, especially single women, or women who travel without their husbands, embraced the idea of women-only travel because of how the traditional tour operators gear their activities towards couples, and no one enjoys being the fifth wheel. Women's needs are very different than those of men. We tend to be less goal-oriented and less competitive, especially when we are on vacation. We don't have the need to boast or impress others with our knowledge and skills. The important issue to traveling women is connecting with others, be it the local people or other women in the group. In a nutshell, people are more important, and they are what you remember more than seeing another sight. Memorable travel experiences are more valuable when experienced in a company of new, like-minded friends.